Wouldn’t life be easier if the world revolved around what you’re already good at? Sleeping, for instance, or eating, or laughing at videos of giggling babies. Fortunately, as a consultant, your work world does revolve around a skill you’ve already mastered. 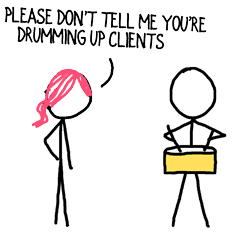 Better yet, when you apply that skill to business development you’ll drum up plenty of new clients. As a consultant, what are you best at? 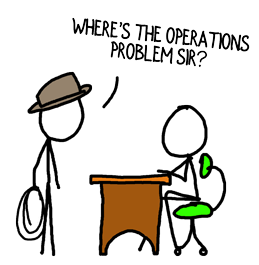 Solving your client’s problems! Every time you’re hired, your client has an issue—something has gone wrong or an aspiration is unmet—and you help them make the right decision or develop a path from here to Shangri La or work through the intricacies of implementation. Discovery is the art of asking questions, and you’re great at it once the project starts. You ask for data. You ask the data to reveal its secrets. You ask customer or employees or bosses or competitors for information. For insights. For perspective. You gather evidence before jumping into analysis, then you probably seek additional facts to make the outcome even better for your client. Now, apply that discovery prowess to business development. Ask your prospects MORE questions. Most consultants stop asking questions waaaay too soon. Yesterday, three separate consultants told me about their difficulty uncovering the value of the projects they were pursuing. When I role-played the conversations they’d had with their prospects, it was clear they accepted responses without delving deeper. Don’t settle for a surface answer. Dig. Probe. Discover! Discovery will fuel your success at every stage of business development. By asking colleagues and clients whether they see you as capable, you’ll gather the evidence you need to bolster your self-confidence. When you ask prospects what they’ve paid for in the past, you’ll learn how to build a Fishing Line that combines a hungry target and an urgent, pervasive, costly problem. Creating more connections, nurturing relationships and unearthing project opportunities are all natural byproducts of ongoing, persistent inquiry. Your path to becoming the obvious choice rests on a foundation of discovery. It’s how you build trust, establish value, become liked, and hold a magnifying glass up to your prospects’ needs and wants. Diligent probing when a project opportunity first arises is the secret to closing easily at the end. Discovery is even integral to developing perfect proposals and negotiating lucrative contracts. Of course, all this probing and prodding and exploration is most effective when you have powerful questions at your fingertips the moment you need them. I have pages and pages of questions, organized by the different parts of the business development process. That compendium has served me well. What about you? I’d like to hear about your discovery process. What is your favorite question to ask prospects? Thanks David. Your blog turned on a light bulb for me with regards to one of my clients. I have been there so long that they have begun thinking of me as a worker and not as a consultant. That’s a compliment to some degree, but I realize that I have stopped asking tough questions and instead turned to doing the work right in front of me. It’s important work, and they appreciate it, but pretty soon they are going to start seeing me as a high priced worker, instead of a valuable consultant. Eureka! We’ve turned on light bulbs for each other, Ken. 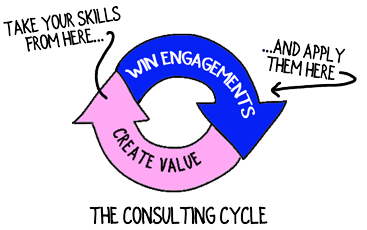 I generally speak about the “Irony of Expertise” as a problem that plagues consultants during the business development process. As you’ve pointed out, it can also haunt us during delivery. Any time we think we know the answer, there’s a tendency to halt inquiry and stop listening. Good luck with the tough questions today. If you have a moment, post one of the questions you’re going to pose for your client. That may spark a great idea for another consultant in the community. Bob, that’s one of my favorite questions too. I sometimes phrase it as, “At the end of this initiative, when you’re looking back on it, what would you need to see to feel absolutely delighted?” When prospects envision–and explicitly detail–their rosy future, their desire and sense of urgency increase. Thanks for posting the question.